Are you aged between 12 and 25 and feeling creative? 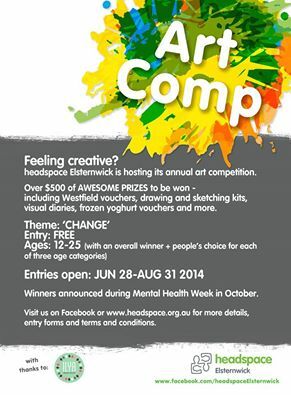 headspace Elsternwick is very pleased to announce its second art competition! Entry is free and open to all young Melbourne artists, with no requirement that they access headspace Elsternwick’s health services. Just about any type of artwork can be entered, including drawings, paintings, photography, and sculptures. All entries will be judged by a panel of local artists, and displayed at headspace Elsternwick. Terms and conditions and entry forms are available via the Facebook event page. There are great prizes to be won, including prizes kindly donated by local business Ilya Frozen Yoghurt. Entries close on 31 August, so it’s time to get creative! For more information about headspace, please visit the official website. headspace is the national youth-oriented mental health foundation, and has offices all over Australia. For more information about other outreach programmes being run by the Youth Advisory Committee for headspace Elsternwick, please check out their Facebook page. This entry was posted in Art, Arts and tagged art, melbourne, opportunity. Bookmark the permalink.